I promise this will be the last PBS series for a good 15 posts or so. I’ve previously written about Arthur several times on this page, and each time I’m astounded anew by the show’s longevity. And sure enough, while doing my research for this post I discovered that, yes, IT’S STILL ON. Clocking in 200+ episodes over the past SEVENTEEN seasons, Arthur is the third longest-running PBS children’s series (and the second-longest still currently airing, after Sesame Street), as well as the third longest-running animated series on TV (after The Simpsons and South Park). 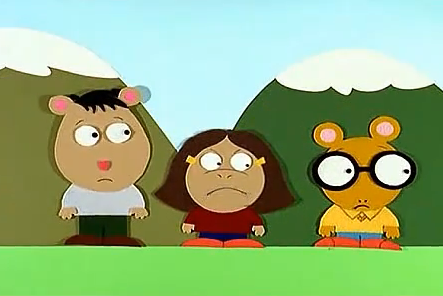 The series is based on Marc Brown’s Arthur books, and many early storylines were adapted directly from said books. Episodes follow Arthur Read, a third-grader who also happens to be an anthropomorphic aardvark, as he navigates his day-to-day life in Elwood City, a community apparently modeled after the suburbs of Boston (the show originated at WGBH, a Bostonian PBS station). Arthur’s family includes his father (a chef and caterer), mother (an accountant), and his two younger sisters, outspoken preschooler D.W. and baby Kate. Also prominently featured are Arthur’s numerous classmates, who fulfill the classic archetypes of grade-school stories: bully Binky Barnes, tomboy Francine Frensky, rich girl Muffy Crosswire, scholarly polymath “The Brain,” and Arthur’s jokester best friend, Buster Baxter, among others. Other characters get their time to shine, too: Stern and imposing teacher Mr. Ratburn, Arthur’s paternal grandmother and maternal grandfather, D.W.’s imaginary friend Nadine, and the rowdy crew of “tough customers” who count Binky as an on-again-off-again member are just a few of the series’ large cast of recurring characters. Giving screentime to so many different characters, and, more importantly, actually DEVELOPING those characters, is one of the show’s greatest strengths, and makes Elwood City seem like a real place. Few other series so ably create such a thriving, three-dimensional fictional community. Even “archetype” characters like Binky and Muffy are given a depth beyond that of mere stereotypes. What’s more, supporting and even minor characters frequently receive their own episodes, which may feature Arthur himself only tangentially. Some of these episodes rank among the show’s strongest, such as one in which introvert Fern gains confidence and friends by putting her passion for mystery-solving to good use at a slumber party. Arthur is also remarkable for its broad appeal. Despite being targeted at children, the show often includes jokes, and even specific references, aimed at older audiences. In “The Contest” (S4E4), Arthur and his classmates submit episode ideas as part of a contest put on by “Andy and Friends,” an in-universe television series meant to be the Arthur of Arthur’s own world. That alone is sufficiently weird and metafictional, but it gets better. Each of the students’ stories is presented in a different animation style, meant to evoke a popular animated series of the time. These include Dexter’s Laboratory (Brain’s story), as well as some decidedly non-”kids’ shows” — Beavis & Butthead, Dr. Katz, Professional Therapist, and even South Park. The writers even threw in some jokes aimed at older kids who stuck with the show. An episode from 2001 (after I had already stopped watching) revolves around the “Henry Skreever” craze, a thinly-veiled Harry Potter counterpart. One of the Skreever books’ lead characters is named Persephone, which Arthur and his friends mistakenly pronounce “Purse-if-own,” a nod to how American children garbled Hermione’s very British name in the early years. The show seems aware of its cross-generational appeal, and invites us as viewers to defy demographics. In one of the series’ best episodes, “That’s a Baby Show!” (S4E10) Buster is excited for the debut of The Dark Bunny, a “dark and gritty,” Batman-style reimagining of the normally Superman-like Bionic Bunny Show. Arthur decides to tune in too, but, while channel surfing, stumbles across “The Love Ducks,” a vaguely psychedelic program aimed at toddlers, which consists of little more than technicolor ducks quacking along to classical music. Arthur becomes a devoted Love Ducks fan, but finds it increasingly difficult to hide this fact from his friends. Eventually, Arthur’s secret is exposed…but his friends’ ridicule is short-lived, as they soon realize that they, too, love The Love Ducks. Based specifically on Teletubbies (which was airing on PBS at the time), Love Ducks is comparable to any other “guilty pleasure” shows we may enjoy “extra-demographically.” I’ve certainly had a few, and in the case of Arthur, I’m not ashamed to admit it. 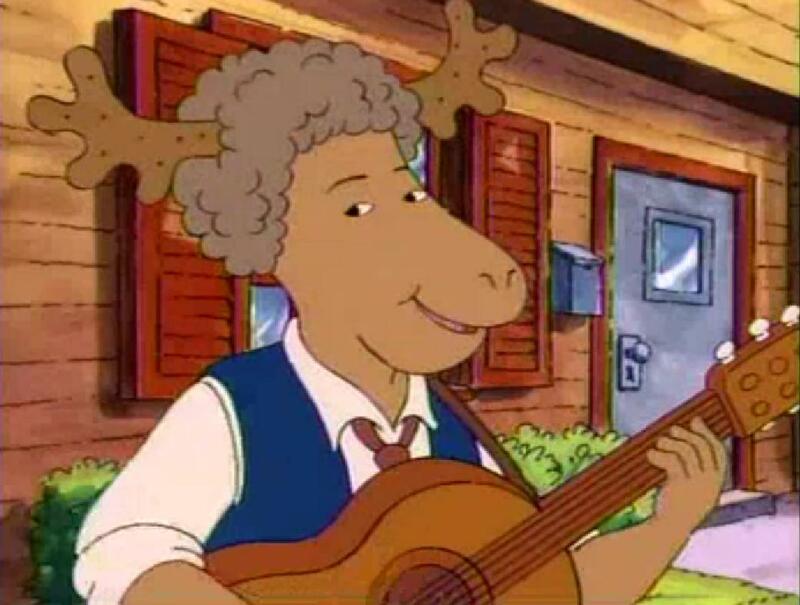 But perhaps my single favorite aspect of Arthur is the music. In the reggae theme song, Bob Marley’s son, Ziggy, sings of “a wonderful kind of day, when we can learn to work and play, and get along with each other.” It’s catchy and upbeat enough. Another memorable number is “Matalii ja Mustii,” a real Finnish song featured in an episode in which Binky is blamed for the Banksy-esque street art advertisements of a Scandinavian band (coincidentally also named “Binky”). But the real show-stealer is “Crazy Bus,” introduced in Season 2, Episode 6. “Crazy Bus” is a wacky, nonsensical song with which D.W. becomes obsessed. As being irritated by his younger sister’s antics is one of Arthur’s defining character traits (occasionally making him a less-than-likeable protagonist), the song reappears periodically throughout the show’s early seasons. Humorously, no one else seems to share Arthur’s detestation for the tune, and “Crazy Bus” becomes a minor phenomenon, even inspiring a “Disney On Ice”-style live stage show. The first CD I ever owned was “Arthur’s First Almost-Real Not-Live CD (or Tape),” released in 1998. In addition to the theme song, “Matalii ja Mustii,” and “Crazy Bus,” the album includes about a dozen brand new songs performed by the show’s various characters. These range from ensemble numbers like the opener, “(Having Fun Isn’t Hard When You’ve Got a) Library Card,” to songs focused on individual characters which perfectly encapsulate their personalities. Mr. Ratburn sings about the joys of assigning homework (“Chart the journey that Balboa took! / Do the first thousand problems in your new math book!”), and Arthur’s dad about the many possibilities which being a chef presents (“You have to try, my latest treat / a jellyfish, inside a beet”). In fact, the songs were so good that they were eventually written into the show proper, receiving short “music video” treatments in “Arthur’s Almost Real Not Live Music Festival” (S3E11). Now, I don’t want to get too long-winded here, but I also wanted to take this opportunity to pay tribute to my favorite characters of the series: Buster and The Brain. Buster’s two favorite things are eating and extraterrestrials, and he’s always ready with a joke. The Brain (his real name is Alan) is very intelligent, but not above human weaknesses like frustration, getting addicted to computer games, or hogging work on group projects to make sure “it’s done right.” He’s also wonderfully eccentric: In one episode, the kids are trying to create their own holiday, and Brain suggests dedicating a day to “the igneous rock,” as holidays should be based on long-lasting traditions, and “what lasts longer than an igneous rock?” I’d like to think of myself as something of a mix between the two characters. And they each got great songs on the “Almost Real” album. Buster’s “UFO Song” details his thorough plan for dealing with first contact, and The Brain actually gets two solo tracks: The “Thinking Tune,” a 40-second didgeridoo solo over which he occasionally says “Hm…”, and the much more impressive “Jekyll & Hyde,” which is insanely catchy. Watch it below, and you too will be chanting “Jekyll Jekyll Hyde, Jekyll Hyde Hyde Jekyll!” in your head for the next 15 years. This post is quickly getting long, but before I wrap up I have to point out the show’s one main weakness. Often in animated television, young male characters are voiced by adult women. There is a good reason for this: Puberty. While a woman can provide roughly the same voice year-in and year-out, a real, genuine boy-child can’t. But Arthur, for the sake of authenticity I guess, cast young boys in the role of Arthur (as well as D.W., for some reason). This move can work well if a show is set to run for, say, three seasons (as was the case with another show we’ll get to further down the line). But not when the show drags on for seventeen years. I largely stopped watching when, after Season 4, Brain was recast, and his trademark intellectual, relatively deep voice was replaced with a much higher, distinctly “wrong” voice. At the end of Season 5, the same was done to Arthur (apparently, others found the voice of “Season 6” Arthur so obnoxious that it has subsequently been re-dubbed. To date, there have been six “Arthurs,” six “Brains” and five “D.W.s”. Such shifts are jarring, and mildly insulting to children’s intelligence if producers expect they won’t notice. To make it worse, Buster and Binky (as well as adult and most female characters) have had the same voice actors throughout the show’s run, raising the possibility that the same could have been managed for Arthur, D.W. and Brain. In the long run, though, this is a minor complaint. When the absolute worst thing I can say about a show is “it has wrong-sounding voices in the later seasons,” it’s got to be pretty good on the whole. So while I haven’t seen it in many years, I thank Arthur for its humor and memorable music, admire its deep characterization and varied storylines, and respect its long life. Arthur Read may yet be “walking down the street” for years to come. Tidbits: Throughout the years, many guest stars have appeared on Arthur. Typically, these stars are of a decidedly “PBS” variety, including poet Jack Prelutsky, celebrated cellist Yo Yo Ma, Alex Trebek, and even Mr. Rogers himself. One entire episode takes the form of a “ballad” sung by strolling minstrel / narrator Art Garfunkel.